“Many people have had at least one bad boss,” says LeBow PhD candidate Katrina Graham. And it’s the ubiquity of that experience that makes abusive supervision such a fascinating field of research. Given Katrina’s background as a lieutenant in the Air Force, one might envision her encounter with a bad boss coming in the form of a bellowing drill sergeant, but she explains that this isn’t the case at all. In fact, she credits her time in the Air Force for giving her a chance to gain real world managerial experience much younger than what’s typical in the private sector. To explore the dynamics between supervisors and subordinates, Katrina’s research employs anonymous online surveys. Drexel students on co-op were recruited to answer questions about how they were treated, and their supervisors were asked about their own leadership traits. Comparing the two sets of data gave insights into what beliefs about leadership were more likely to correlate with abusive behavior. The results also helped highlight how the traits of an employee might make him or her more likely to be a victim. What she’s found is that if a supervisor believes it’s justifiable to dominate a subordinate group, they’re more likely to exhibit abusive behavior. And perhaps counterintuitively, an employee with strong self-esteem and confidence is more likely to be a target of the abuse when paired with a dominant supervisor. It’s a challenge, but one Katrina has some experience with from her time in the military. “As a personnel officer in the Air Force, and now with training engineering students on organizational behavior concepts, I’ve found that it’s really important to highlight the relevance of ‘people’ skills to technical fields in order to have an engaged audience,” she says. Katrina will continue applying her insight and research in the classroom upon completing her LeBow PhD. 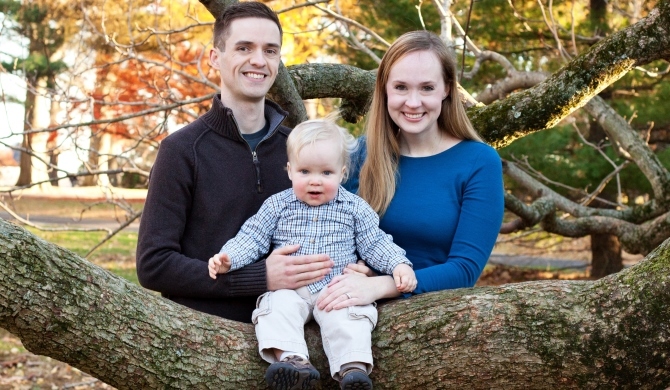 She will be moving to Boston with her husband Pete, son Cole and daughter Sadie (not pictured) to take a position as a tenure-track assistant professor in management at Suffolk University in August 2015.